Very surprising no one was in the theatre when I watched this movie. 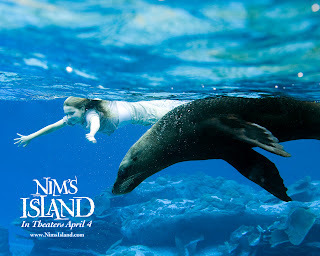 Nim’s island provides entertainment, morals and inspiration. The little girl, starring Abigail Breslin, gives us a pictorial comic image of her lost mother at sea. She lives with her dad, Gerard Butler, on their south pacific island with an albatross, seal and lizard. They co exist peacefully with the wildlife in the jungles. The turning point is the book adventures of Alex Rover getting delivered to them. it’s Nim’s hero , he is so brave and fearless, nothing fazes him. In the States, San Francisco, the author of Alex Rover has problems getting out of her house. Alex is short for Alexandra, Jodie Foster. She’s excellent, I kept laughing at her being kind of a neat-freak using several bottles of handwash detergent to clean herself, making people deliver her things on the door without stepping out of the house. Later, it’s revealed to people who don’t understand why as agoraphobia. One day, Nim’s father sails off to sea to find more sea creatures. He’s a renouned marine biologist of National Geographic. But he is no seafarer, upon his journey back, his boat meets a storm. I felt terrible for him, tossed about like a small person. It’s heart- rending that Nim didn’t follow him when he asked her to. From that point onwards, I thought it would be a sad ending. Meanwhile, Nim is eluded that the author is really Alex Rover, a guy. Excitedly she emails ‘him’ that she’s willing to help answer any questions. Her father answers his email daily. The author dares not venture out of her house, thus she can’t do research. She requests for Nim to help her find out what’s it like inside a volcano. She climbs a volcano and injures herself falling down. You can see the contrast between the feisty little girl and the timid (scaredy cat) woman- Nim braving the rocks sliding down with only a rope and her lizard for company; the agoraphobic not daring to leave the house at all. Nim waits for her father to return in vain. More tourists want to invade their island, so she hatches a plan to bomb them off with crawlies. Even after the tourists take off, only one boy knowing she’s there, her dad still does not come home. She’s so courageous that I admire her! It is my secret dream to live with animals in the jungles, being totally free and wild. Meanwhile, when Alex learns of her plight, she tries to navigate there with only the rough coordinates. That’s a hilarious sequence of moments which shouldn’t be missed. Alex herself speaks to her character looking like a nutcase to an audience, arguing why she is even going there in the first place. On the final leg when she gets a boat to the island and is abandoned midway, the main thing driving her is poor Nim with an injury. Ironically Alex is almost drowned in the seas and saved by Nim and her seal. The girl is furious with her when it’s not the perfect strong man that has come to right things. The most poignant moment is apparent as Nim finally gives up hope and breaks down. Foster timidly reaches out to hug her… and they both acknowledge that they need each other’s company. Nim thought that she could live with her pets only, but deep inside she felt desolate and lost. And yet the satisfying conclusion will bring you tears and laughter. Action comes in little bursts, but the warmth and practicality will be a solace. It well-deserves a commendation.